Here are some of the restaurants that participated, followed by a recipe from Florence Lowell, executive chef and owner of Naked Oyster. You have to be quick to get a seat at The Long Table. The Hyannis Main Street’s signature fundraising event, dinner for 190 put on by the downtown Hyannis Business Improvement District with the volunteer efforts of a score of Main Street chefs, generally sells out the first day tickets go on sale – May 1 of each year. The Long Table, held Thursday at The Beechtree Alley, was co-sponsored this year by Edible Cape Cod Magazine and Rockland Trust Bank. The menu used even more local ingredients, at the request of Dianne and Doug Langeland, publishers of the magazine, which promotes local foods. Hyannis Main Street’s executive director Elizabeth Wurfbain writes, “Our goal is to bring together friends and neighbors, those who are fans and celebrate our F.O.O.D. District. Fabulous Owner Operated Dining. There are over 50 restaurants, one of the densest culinary locations in the state. Suppliers included: Cape Abilities, Chatham Bars Inn Farm, Hatch’s Fish Market, Not Enough Acres, Truro Vineyards, Cynthia Cole and C.L. Fornari. “For this year’s Long Table event we wanted to do an elevated five-course dinner using as many local ingredients as possible. We wanted to really refine a menu that would showcase, not only seasonal local ingredients, but also the talents of the many chefs and the restaurants on Main Street in Hyannis,” O’Toole writes in an email. Here are some of the restaurants that participated, followed by a recipe from Lowell. Appetizers: Kelly’s On Main, Rendezvous, Les Hemmila’s own Raw Bar, Stephanie’s Gin & Juice, Truro Vineyards Dry Line Gin and The Local Juice. EmBargo chefs made Duck Confit, with tart greens, snap peas and raspberry served in tasting spoons. The Roadhouse Cafe provided chilled cucumber dill soup, with smoked salmon crostini. Prosciutto breadsticks were provided by Palio’s Pizzeria, Pao de Queijo and The Brazilian Grille. Common Ground’s salad was gorgeous: Local greens,shaved carrots and radish, herbs, lavender honey vinaigrette, all topped with a bright edible flower. 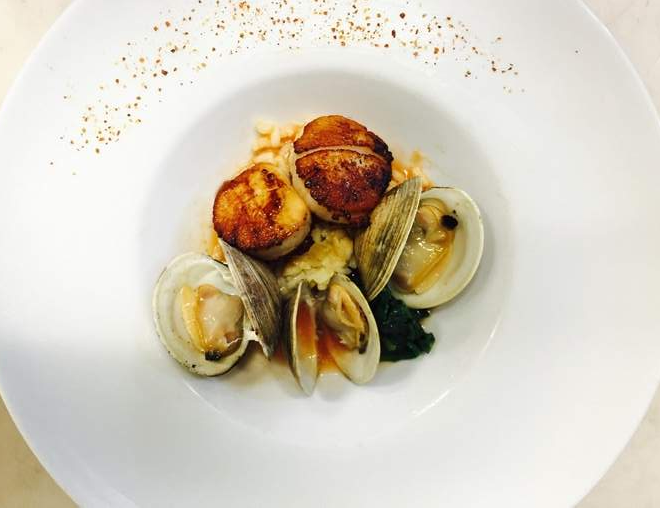 Naked Oyster brought scallop, little neck clams and kale in tomato broth (see recipe below). Tap City Grille, with Pizza Barbone: Pork crepinette, swiss chard, carrot, fennel and honey. Tap City Grille’s chef, a proponent of snout-to-tail cooking and local foods, butchered the pig himself. Desserts included Buttermilk Pannacotta, strawberry-rhubarb gelato and chocolate bark from Pizza Barbone, Katie’s Ice Cream, and Kandy Korner. Here is Naked Oyster executive chef/owner Florence Lowell’s recipe, served at The Long Table, paired with the red wine, “Altitude” Red Blend, Beira, Portugal. Peel and small-dice potatoes. Cook in salted water until tender but not soft. Drain, add chopped parsley. Clean kale by removing center vein. Blanche in salted, boiling water for 5 minutes or until kale is tender but not cooked all the way. Shock in ice water, drain. Set oven at 450 degrees. Quarter your tomatoes, rub them with olive oil, salt, pepper, thyme and basil. Roast for 20 minutes. Clean green onions, trim to 6 inches, chopping off the top green part. Blanche and cool the lower part. In a sauté pan, add a little olive oil, shallots, 2 cloves of chopped garlic, clams, white wine and a little water, cover. Let the clam open, remove your clams, strain and save the broth. Add salt and pepper to taste. In a sauce pan, add filtered clam broth to the roasted tomatoes, and the Pernod, simmer for 20 minutes, and press through a fine mesh strainer, reserve. Rub the blanched kale with olive oil, add the chopped green onion, some chopped garlic, salt, pepper, red pepper flakes if desired. Place in oven-proof dish, cover, braise for 10 minutes. Season scallops, sear in hot pan with oil and a little butter, add green onions on the side. Warm up the broth, add diced potatoes and little necks. Simmer until warm, do not cook. In 6 soup bowls, place the kale in the center of each plate, with a straining ladle divide the potatoes, 3 littlenecks per plate, 2 seared scallops, and place chive across the plate. Ladle the tomato broth.